DIGITISATION: The British Christmas Canon goes hand in hand with the CD era. The need to fill up 2 or even 3 discs of Christmas music (including all the American oldies, of which more later) has meant an extended shelf life for a vast B- and C-List of Christmas songs – Chris Rea, The Pretenders, Cliff, et al. – which had to be dusted off every year to fill up space. But now we’re moving into an era defined by playlists, not albums, which means you get to actually pick the Christmas songs you WANT to hear, not the ones EMI can afford to make up the numbers on Disc 2. GLOBALISATION: The USA had its Christmas song boom in the 40s and 50s – where lounge-y standards like “It’s Beginning To Look A Lot Like Christmas”, “Let It Snow! Let It Snow! Let It Snow!” and, of course, “White Christmas” originated. The Phil Spector Christmas Album feels like a culmination of that. The British Christmas boom was something of a reply to that, and at its zenith the popularity of the 70s and 80s hits meant all but the hardest-core of US standards were relatively neglected. But these days the American experience of Christmas is more culturally prominent – goodbye UK sitcom specials, hello repeats of Elf on Sky Movies – and just as with Black Friday (and Hallowe’en) the UK is falling into line. The golden age of American easy listening Christmas music is firmly back in style, and everyone from Bing to Brenda Lee is as likely to get an airing as Shakey or Slade. (I’ve even heard “Christmas Alphabet” get an airing once again.) And for people under 30, they have the distinct advantage of not being your parents’ pop music. So in the pub – of course it was in the pub – I predicted we’d see a survival of the hittest effect shake out – an “A-Canon” of genuine untouchables, and a B-List rendered much more flexible by the decline of CDs. What would be in this A-Canon? I judged – based largely on hunchwork and my experiences of the office playlist – that it would include Slade, maybe Wizzard, certainly Wham!, Kirsty and the Pogues, and Mariah. Everything else – McCartney, Elton, Shakin’ Stevens, Greg Lake, and, yes, poor Jona Lewie – faced cold holidays ahead as they were gradually winnowed out in favour of more Americanised Christmas songs. That’s just my opinion, though – where’s the evidence. Well, this is the first year that the Official Charts Company has released its figures for streaming Christmas songs. What people want to hear and are playing, not just what turns up on compilations. If there is a quiet revolution underway in the Christmas Canon, here’s where you’d see it. And the evidence is… interesting. Mariah at the top, with Wham and the Pogues rounding out the Top 3. I was right about them, but wrong about Shakey (still clearly A-List at #4). Band Aid is too hard to call – it’ll be played more this year cos they have a version out. Below that top 5, though, we see a cluster of vintage American Christmas songs and Wizzard, with Slade (far lower than I expected), Elton, Chris Rea, Boney M and Greg Lake following behind, and then Michael Buble versions of standards filling out the rest. No Spector (maybe he’s not on Spotify? ), no Cliff, and – thank the baby Jesus – no “Wonderful Christmastime”. We’ll need to wait to next year to firm up the trends here, but it looks to me like something really is happening to Britain’s Christmas soundtrack – a resurgence of interest in older music, with a core of canon favourites solid at the top. 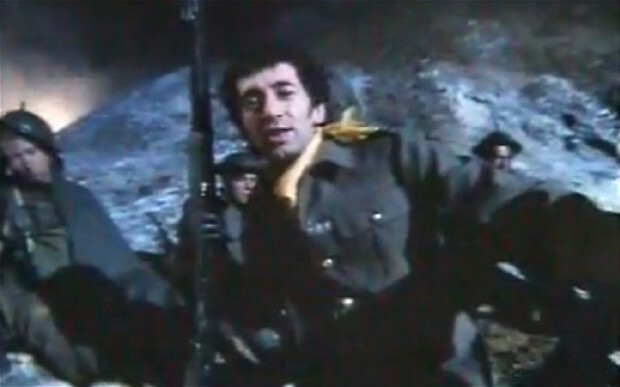 And, as I suspected from the beginning, there might be no room at the inn for poor Jona Lewie. The Spice Girls version of Christmas Wrapping gets a lot of play from me. It was a B-side to one of their Christmas number 1s. I think 2 Become 1 is more Christmassy than Stay Another Day. Then again the Die Hard soundtrack is probably more Christmassy than Stay Another Day. Poor rubbish Cliff. I keep remembering his performances of ‘We Should Be Together This Christmas’ on TV from the time in which he mimes dialling a phone and talking to someone in the intro. Note to me: Stop remembering this and listen to Cristina’s ‘Things Fall Apart’ instead. Fuzzy’s Christmas is a worthy ’90s alt-rock/pop addition to Xmas-playlists. Corgan doing ‘If there is a god’ at an Xmas show w/ ace Mike Garson accompaniment too maybe . I’ve heard STC as much as any other xmas song this year. It’s muscled its way into the canon given the vague reference to xmas.It’s a good song but not really suited to January-October plays if you ask me. You can enjoy those that dont mention xmas in the lyrics (east 17, Frankie) any time of the year. Of the xmas centric stuff The Pogues and Slade I would play throughout the year if given a chance. In the case of Slade it’s one of the highpoints of Glam Rock and in The Pogues it fits in with most of their stuff around their 80s heyday.Plus Saint etienne + Tim Burgess that I could enjoy anytime simply because its Saint Etienne. Stay Another Day might be on its way out. I don’t really associate with Xmas at all and I’d look for the normal in the studio video first rather then the dire xmas video made when it became clear of its potential.And the personal background to it is not best suited to the festive time. We’ve got a chance to discuss Sir Cl…… coming up but Mistletoe and Wine is the one for me that gets less and less play with every passing xmas.For an artist with a strong association with the holiday season he hasnt come anywhere close to an a-list blockbuster. 2 brief points. One of the worse examples of a recent Christmas song, one that wanted so desperately wanted to be in the canon that it sounded woefully contrived and forced was ‘Don’t let the bells end’ by The Darkness. Horrible on every level. But Coldplay’s ‘Christmas Lights’ from 2010 I think is rather lovely and may well grow in stature over the years. As for Cliff, I think he lost a lot of good grace with ’21st Century Christmas’ ten years or so ago. So bad, and instantly forgotton. I like ‘Saviours Day’ though. Can I throw in a vote for XTC’s “Thanks For Christmas”? I heard it once in some store outside of a casino…when I got home, was surprised to learn it was the sarcastic Swindon group….though this was years before I really got into them, at the time I only knew them for “Nigel.” I see it didn’t chart anywhere on its mid 80s release, so it wouldn’t be part of the canon. Another recent song that seems to be wedged into the Christmas scene, at least here in the U.S., is Fleet Foxes’ “White Winter Hymnal.” One deep look at the lyrics should keep it from the scene, but it mentions scarves and snow, so there it goes. George Michael’s “December Song (I Dreamed Of Christmas)” struck me as both rather lovely, and probably also the best single he had released for years – an enormous return to form. But….straight in the charts, straight out, and completely forgotten ever since, Canon bypassed well and truly. A pity. So on tonight’s Channel 5 (I think) prog about Christmas songs, the Tony Mortimer interview made clear (obviously) that Stay Another Day wasn’t written as a seasonal song. But was equally made clear that the arrangement was explicitly intended to make it a Christmas hit. And since in a recorded piece of music all elements count, I’m saying it’s a Christmas song. @47 Ch 4, I think. That Tony Mortimer interview was great. He’s almost unrecognisable: much fuller-faced, bearded, in a cable-knit sweater. He explained very winningly – half-rueful, half-amused – how the song had meant a lot to him, but had been taken out of his hands. It’s about his brother who committed suicide, but became interpreted first as a romantic love song, and then with the video and arrangement as a Christmas hit. Realising it’s a song about family and loss makes it seem much more appropriate for Christmas than I had realised. A great detail is that the second, Xmas-themed video was a Boney M homage. Re48: Yeah, I loved the side-by-side with the Boney M footage. I do wonder (though this may just be an excuse to excuse my ignorance) how many people buying “All I want for Christmas is you” don’t actually think of it as a Mariah song? It doesn’t sound very Mariah, she’s toned down the usual pyrotechnics, in fact it sounds more like a glam stomper – or a glam stomper covering a classic. #6 – the definitive versions are of course the ones on A Christmas Present. Not just because that’s the one we had at home, but also because it has a pop-up gatefold sleeve. That’s science, that is. The web browser was originally planned the cellphones that are not efficient in running a conventional Internet web browser.It was introduced in 2005, as a pilot project in partnership. I’ll add this here rather than The Strange Death Of The UK Charts (http://freakytrigger.co.uk/ft/2009/01/the-strange-death-of-the-uk-charts/) post comments which has contained some previoux Xmas chart hits discussion although that post will be ten years old in a few weeks and worth its own comments bump then (if not a whole new post covering the effects of the last ten years and the steady descent to only around 300 new chart hits per year). Just over half of the songs in this week’s Top 100 are Xmas-themed, including 8 of the top 10, buoyed by so many shops and restaurants insisting on piping out the same Spotify/Apple Xmas playlists as each other. It’s their staff I feel slightly more sorry for. A by-product is that there is no Ed Sheeran presence at all, with last year’s Xmas #1 ‘Perfect’ finally being squeezed out of the 100 after a 67 week run (of 84 total). There’s a new high for Jose Feliciano’s ‘Feliz Navidad’ just outside the Top 75 at 77. The Waitresses ‘Christmas Wrapping’ finally made significant gains on previous years this Christmas vaulting to 46, just one place below its original peak position in 1982. The Jackson kids ‘Santa Claus Is Coming To Town’ is into the Top 40 for the first time, having stalled just outside in 1972. Elton John’s ‘Step Into Christmas’ (which I have yet to memorise a note of) continues its unusual resurgence in recent years, surpassing its original peak position (from last Xmas) by one place, into the Top 10. ‘Fairytale Of New York’ managed to equal its joint best performance since first release by reaching #4. And somehow Mariah was denied again at 2 but it still just seems like a matter of time.